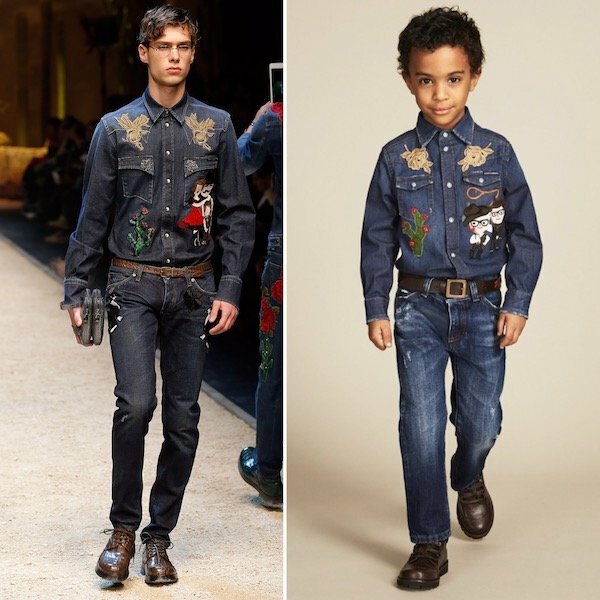 How cool is this cowboy look by Dolce & Gabbana Junior featuring this boys mini me Sicilian Western blue jean denim shirt and jeans. Inspired by the Dolce & Gabbana men's runway collection featured at Milan Fashion Week, this 'Sicilian Western' themed design has a 'washed out' and faded look, with distressed areas. There are assorted appliqué on the front, including horseshoes, cowboys and bees, in a fusion of Sicily meets the Wild West. Looks great with these matching DOLCE & GABBANA Boys Blue Sicilian Western Jeans embroidered with patches at the back of D&G cowboys and flowering cacti, with a leather logo flag on one of the back pockets. Layer the look with this super cute DOLCE & GABBANA Boys Grey Sicilian Western Cotton Top embroidered with a cowboy, rocket and horseshoe appliqué in a fusion of the Wild West meets Sicily.